I've been sitting on this post for years. 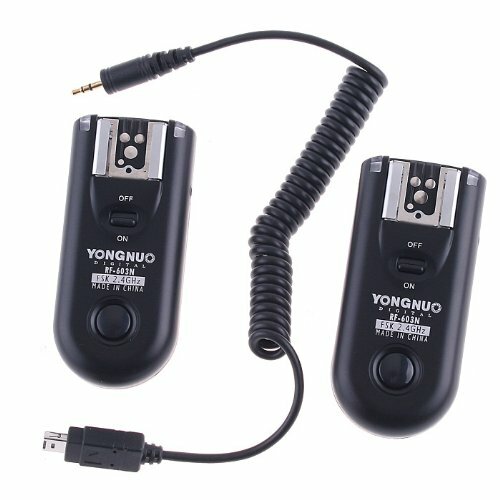 It's just a collection of thoughts I've been gathering about my Yongnuo RF-603N radio triggers. I bought them a few years ago and intended to post a review, but never got around to it. But I still have this collection of raw impressions. The RF-603N has been replaced by the RF-603N II which essentially fixes a handful of issues with the original version that I have. The differences are 1) the on/off switch is now on the side of the trigger so it isn't obscured by the mounted speedlight; 2) the sync speed goes up to a full 1/320 (yea! ); and 3), it has a more secure hotshoe. These features pretty much resolve every issue I had with the originals, and at around $35 I'll be upgrading for sure. Other than the aforementioned improvements with the new model, my impressions of the RF-603N are relevant. So I'll post in raw form in case somebody is interested. Build quality is okay. It's not particularly rugged, but it's not particularly delicate either. Actually better than I expected for the price. The feel of the switches and buttons is decent - positive action with no slop. Batteries are standard AAA, so replacements - both alkalines and rechargeables - can be found virtually anywhere. Mount one on the camera and one on a speedlight. Each unit automatically figures out whether its supposed to be the transmitter or the receiver. This makes it pretty fool-proof, except that the transmitter must be mounted on the camera in order for the unit to knows it's supposed to be the transmitter! Have to turn the receiver on before mounting the speedlight in its hotshoe because the speedlight obscures the on/off switch. No locking foot. All my speedlights have locking mechanisms, as do all my mounting brackets. So for me, it's only a problem for the transceiver that is mounted on the camera. Because of the light weight I'm not worried about it, unless I'm also mounting a speedlight in the transceiver's shoe which I might occasionally do if I wanted to use both manual radio triggering and CLS simultaneously. Possible, but rare. Support manual flash exposure only. No TTL. Worse, no remote power adjustment. So if you need to adjust the flash power, you have to physically change on the flash unit. Shutter trigger is a nice bonus. I have a Nikon ML-L3, but it's infrared and so its triggering is short-range and not very reliable. The RF-603's triggering is very reliable and long-distance. Shutter trigger has a nice half-press focus. On the other hand, there's more lag. In fact, my test show that it lowers the maximum sync speed from 1/320 to 1/200. I didn't want mine rattling around loose in my lighting bag, so I store mine in a small velvet pouch that used to hold a wireless travel mouse. Fits nicely and should prevent scratches and dings. I think a small lens pounch would also work.